This week has been a watercolour week with a bit of digital art thrown in. Our autumn has been crazy, maybe because of the drought which broke last week, bushes are flowering that should not flower until spring! There are camellias, magnolias, daphne and even blossom on the fruit trees. Of course I had to pick the daphne as it has an amazing scent. In this picture I used gouache as I wanted to use white to give that translucent waxy feel the flowers have. This painting is a watercolour abstract; I did after a painting I did earlier in the week. I tend to mix up too much paint as it can be difficult to get the same tone if you have to mix up some more during the painting. As a result I have lots of abstract watercolours, which often turn into pages for my journal. In my digital work I have been carrying on with my theme of behind the lace series and it is evolving quite well. I am quite pleased with the one below, this beauty I found on the web and I used brushes from http://www.annikavonholdt.com/brushes/ as well as a photo of an old window with overgrown scrub outside. I think it gives as feeling of times long gone. For my ladies I have decided to use a mix of images from free copy right sites and my family and I am going to experiment with drawings or paintings of the ladies concerned. I won’t be posting for the next few weeks, as I am having surgery on my shoulder next week, but I will visit! Time to catch up on my reading hopefully! Perhaps, I will do some drawing with my left hand! Your flower watercolour is simply beautiful - I love the effect you created with the light and shade. 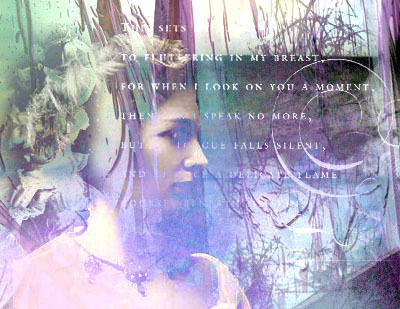 Your ladies and lace digital piece is great - these will look wonderful together when you have completed them all. oh, and I meant to say, good luck with the surgery on your shoulder - I hope it fixes it so you can get back to painting the bigger pictures that you liked to do. Beautiful artwork as always!! You will be missed, will say a little prayer for your quick healing!! Your art work is such a treat for the eyes Sharon, I've loved visiting you here. Those flowers are so beautiful! Good luck with your surgery Sharon. Sending good wishes your way. I love, love, love your flower painting. The colors are so beautiful. I just want to take the flower off of the page and bring it into my living room. You used many of my favorite colors this week. Lovely pieces this week! Good luck with your surgery! Beautiful work. I love the depth and colour in your flower painting, the shapes in your abstract and the layers in your digital art. I love them all! 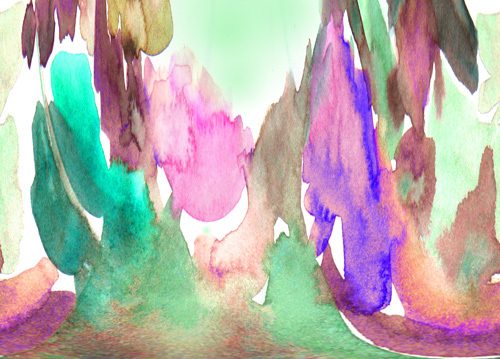 Your flowers are beautiful, but that watercolour abstract is really amazing. Love it! Hope all goes well with the surgery, and that you'll recover real soon! Wonderful paintings and the photo-art especially! Good luck with the surgery! And let's see some left hand drawings, they tend to be very expressive! You paint flowers so beautifully, very light and transparent. really lovely art projects-your watercolour of the daphne is fantastic!! Beautiful watercolor, the colors are gorgeous. HPPF! love your paintings this week! I will pray for you during your surgery and recovery. Happy PPF! Beautiful, beautiful watercolor! Hope your surgery goes well. Love, love, love your watercolor floral! Beautiful! oooh gorjuss, just gorjuss. Happy PPF and have a great weekend. your watercolor effects are really creative. The journal spread is just wonderful-- love how you blend the elements together. Wishing you speedy recovery after the surgery sharon! Take care! WOW! You nailed it. Great work, I especially love those colors! Thanks for sharing your work. Happy Paint Party Friday! 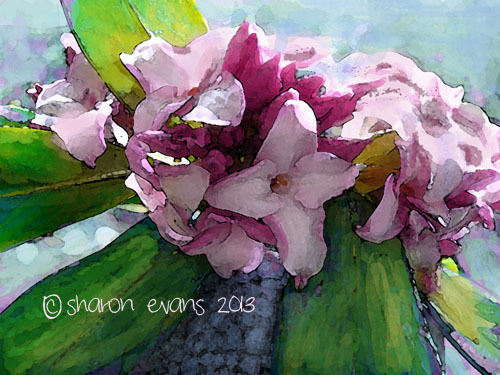 Dear Sharon, beautiful watercolours. They are gorgeous!!!!! Good luck with your surgery. Love and blessings to you. I was on the lookout for your post, when I remembered that you were having your surgery! Is it done already? Hope it went well!!! Hey Sharon just stopped in to tell you I miss you this week! I remembered you had surgery and wanted to wish you well. Hope you are healing and can at least click on this to read that you are loved!! Praying for your quick recovery!